How do most genealogists refer to the law that allowed settlers to get federal land if they filed some paperwork and then lived on the land for a period of time? How about the statute under which the State of Missouri was admitted to the Union as a slave state and Maine as a free state, that also prohibited slavery in the Louisiana Territory north of the 36° 30´ latitude line? And what would you call the law that set up the federal courts for the very first time? Got them firmly in your mind? Chances are you got them all right. Chances are you knew the first was the Homestead Act, the second the Missouri Compromise and the third the Judiciary Act of 1789. Now… tell me where they are in the statute books. Could you answer, that quickly, that easily, that the Homestead Act was the act of 20 May 1862, and appears at page 392 of volume 12 of the United States Statutes at Large? Or that the Missouri Compromise was passed on 6 March 1820, and can be found at 3 Stat. 535? Or that the Judiciary Act of 1789 can be found at 1 Stat. 73 (24 Sep 1789)? Because the names we use for some of our laws — their popular names — don’t give us the information we need to find them in the reference books. The answer is a Table of Popular Names: a tool that we can use to find a particular statute when all we know is how it’s commonly referred to. LII has one, and you can access it here. It’s an alphabetical list of federal laws by popular name. All of the statutes have citations to the Statutes at Large, and many of them have hotlinks to an official source for the statute. • The Office of the Law Revision Counsel of the U.S. House of Representatives has a Popular Name Tool that you can browse or search. It also has a downloadable PDF file you can search offline. 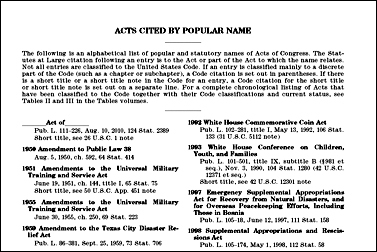 • Findlaw.com has a United States Code Table of Popular Names that you can browse or search, with some hotlinks to actual statutes. And using the statutory citation, you can then turn to either the Library of Congress’ wonderful site, A Century of Lawmaking for a New Nation, where you can access volumes 1-18 of the Statutes at Large free online, or the Constitution Society’s collection of downloadable PDF files of the public Statutes at Large volumes 1-127. Glad to know you’re “getting it,” Yvette — because the two really are so intertwined! Thanks for the kind words. Cornell Law School’s Legal Information Institute (LII) is a fantastic resource. It’s one of the best overall legal resources on the web, for sure. Judy, you are the queen of genealogy and the law, I love your blog. Awww… thanks so much for the kind words, Gus! You’re right — and I’ll fix it, thanks! Just the info I’ve been needing!! Thank you so much. I know the law is important and I have found the laws I have needed…sometimes…. but I really struggle with finding just what I need and knowing where to look (and what topic etc. to look under exactly.) But I always learn so much from you and for that reason I will be seeing you at SLIG in Janauary to learn more about the law. I can’t wait. (And I’ve also preordered the new book from NGS on the law). Looking forward to having you in class, Michelle! Enforcement Act of 1871 is proper name for Ku Klux Klan Act? Thanks so much, Helen. You and Jana Last have both done this for me, and it’s such a joy to know that you both think so highly of my blog. Now that is a T-shirt I need as well!